He Leadeth Me is a self portrait but it is also a depiction of Psalm 23. 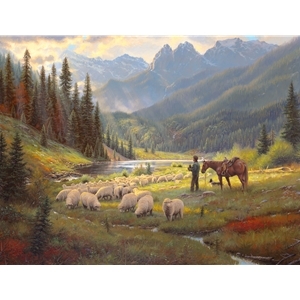 I wasn't intending to portray the Good Shepherd when I began the work, but rather a rancher simply watching his sheep. I needed a model for the shepherd, so I asked my youngest son to come outside and "take a picture of daddy." In the last second, instead of looking down towards the sheep, something caught my eye and I looked up for the photo. When I was well into the painting, events in my life came about that left me feeling lost and confused. After seeing myself in the painting, I felt comforted, because it appears that the shepherd (me) is himself being led. The painting which developed before me depicted the Good Shepherd taking care of his sheep and at the same time, I saw myself and I knew that God leads us by still waters.